TOPEKA, Kansas, August 15, 2011 (ENS) – Earthjustice, representing the Sierra Club, filed a brief in the Kansas Supreme Court Friday seeking to overturn the air pollution permit granted to Sunflower Electric Power Corp. to expand its coal-fired power plant near Holcomb in western Kansas. The coal plant has been the subject of a multi-year controversy after being denied a permit in the fall of 2007 because the new generating unit would produce too much of the greenhouse gas carbon dioxide. At the time it was the first rejection of a power plant permit anywhere in the United States for reasons related to climate change. In the spring of 2008, then Governor Kathleen Sebelius three times vetoed a bill that would have allowed Sunflower Electric to expand its Holcomb power plant by adding two new coal-fired units. When Sebelius was appointed Secretary of Health and Human Services in the Obama Cabinet in early 2009, she was succeeded by Governor Mark Parkinson. 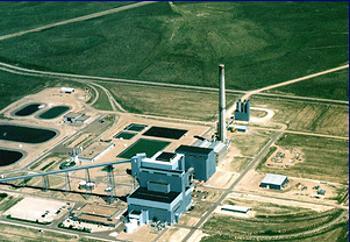 In May 2009, Governor Parkinson approved an agreement with Sunflower Electric that allows the utility to construct one 895 megawatt coal-fired unit with an unprecedented level of carbon mitigation beside its existing coal plant at Holcomb. On December 16, 2010, the Kansas Department of Health and Environment issued a new permit to Sunflower. It is this permit that the Sierra Club is challenging in court. The final permit was grant “due to political pressure by the legislature and governor’s office” even after the Kansas Department of Health and Environment received nearly 6,000 public comments, many opposed to the project, the Sierra Club argues. Issued a permit that falls short of the minimum requirements of the Clean Air Act and will not adequately protect human health and the environment. Engaged in an improper procedure in the granting of the permit based on a legislative directive, not sound science. Denied the public a fair opportunity to participate in the process by rushing through review of comments to allow the project to be permitted prior to new greenhouse gas regulations taking effect. Issued a permit without enforceable limits on nitrogen oxides and sulfur dioxide pollution. Did not require “best available control technology” on new pollution sources, as required by law. Allowed weak pollution limits even on hazardous toxic air pollutants in order to save costs. The Sierra Club contends that the power plant will emit massive amounts of air pollutants, including mercury, sulfur dioxide, nitrogen oxides, and particulate matter on downwind Kansans. The plant will rely on water from the declining Ogallala Aquifer, the group points out. Pointing to assertions by both the generating and the receiving electric power companies, the Sierra Club contends there is really no need either in Kansas or in Colorado for the power the new generating unit would produce. Finally, Sunflower owes the federal government millions of dollars for loans taken out to build the existing coal plant at Holcomb Station. Given Sunflower’s massive debt and precarious financial situation, the plaintiffs argue that the company cannot finance this new coal plant itself without putting Kansas ratepayers and American taxpayers at further risk. In a separate lawsuit, a federal court in Washington, DC recently held that the U.S. government violated the law by allowing Sunflower to proceed with this financially risky plant without first examining its environmental effects and alternative actions. But the plaintiff Sierra Club points to a report earlier this summer in the “Kansas City Star” that detailed a “cozy relationship” Sunflower enjoyed with KDHE during the permitting process. The newspaper analyzed hundreds of emails that revealed that Sunflower was allowed inappropriate influence over the permitting procedure and was allowed to draft responses to public comments for KDHE and influence the terms of its own permit, among other things. The emails obtained by the newspaper were not initially submitted to the Court by KDHE. Earthjustice filed a motion to ensure these documents were included in Court records.